It's lasagna season! (According to us, anyway.) And while we love the classic, we don't love all the carby calories. That's why we replace starchy pasta sheets with filling veggies! Here's a new recipe and a handful of favorites to help you celebrate your lasagna love... no noodles necessary! Place mushroom caps in the center, rounded sides down. Top with another large piece of foil. Fold together and seal all four edges of the two foil pieces, forming a well-sealed packet. Bake for 12 minutes, or until slightly tender. Meanwhile, prepare the filling. In a medium bowl, combine crushed tomatoes, ricotta, garlic, onion powder, Italian seasoning, nutmeg, and a dash each salt and pepper. Mix until uniform. Bring a skillet sprayed with nonstick spray to medium-high heat. Add beef, and sprinkle with remaining dash each salt and pepper. Add onion, and cook and crumble until beef is fully cooked and onion has softened, about 4 minutes. Reduce heat to medium low. Add spinach and tomato/ricotta mixture. Cook and stir until spinach has wilted and mixture is hot, about 1 minute. Cut foil packet to release steam before opening entirely. Remove top foil, and carefully drain excess liquid. Thoroughly blot excess moisture from mushroom caps. Evenly fill mushrooms with filling. 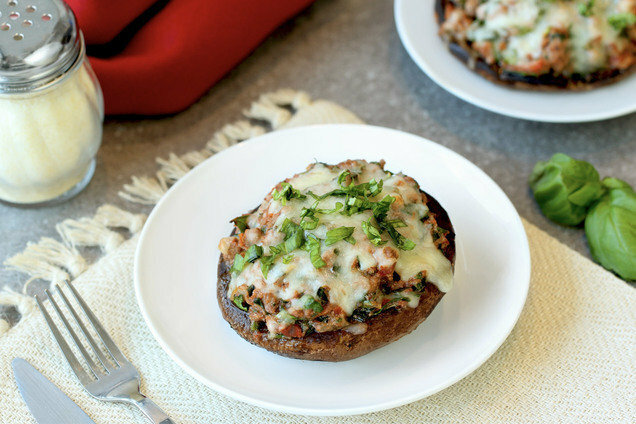 Sprinkle with mozzarella, and bake until mushrooms are tender and cheese has melted, about 8 minutes. Hungry for More Healthy Lasagna-Inspired Recipes? You know that January is National Soup Month, right? Here are 16 stellar soup recipes to celebrate with: slow-cooker & beyond! Click "Send to a Friend," and share these recipes with the lasagna lovers in your life!